Snowy adventures await on the trails this weekend! While it will be rainy at times on Saturday and Sunday, expect several inches of remaining snow on most Catskills trails and summits. Hikers are reporting the need for snowshoes at the highest elevations, as well as microspikes for lower elevations, gaiters, and waterproof boots. If you sneak outside between the raindrops, beautiful trails can be found! Wet, fluffy snow can be found at all higher elevations this weekend. Trail Conditions and Tips: The snow has stayed put this week, in many cases leading to close to a foot near the summits! An important reminder to keep your eyes peeled for heavy, snow-laden tree branches which are at risk of breaking under the weight. Stick to the paths as much as possible to avoid falling tree limbs. Definitely bring snowshoes with you as well as microspikes if you have them. Even the most prepared hiker should expect to get a little wet on the trails, so consider bringing extra dry socks and base layers in your bag if you plan to be out for more than a couple of hours. Roads and Trailhead Status: All marked and officially designated hiking trails in the Catskill Park are currently open to the public. 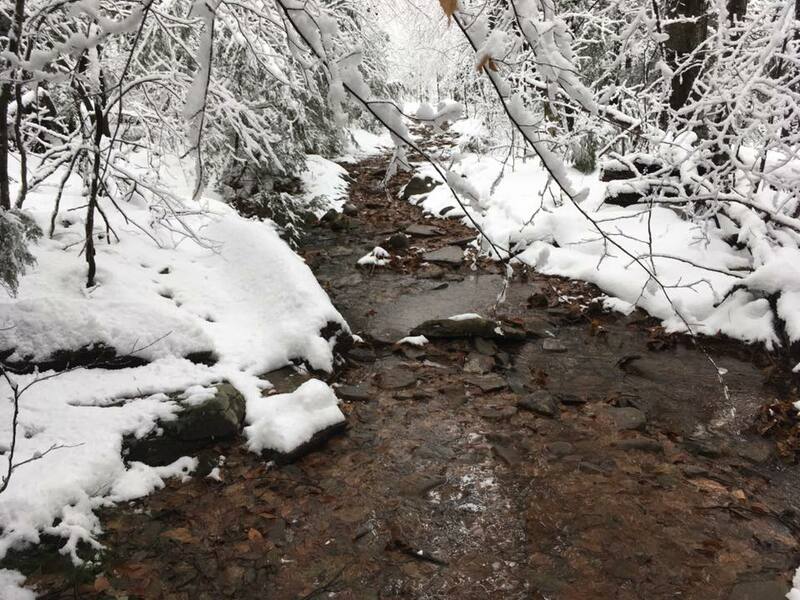 That said, many of the roads that lead to certain Catskills trailheads are not maintained or plowed starting November 1st (such as Platte Clove Road leading to Devil’s Path and Old Dinch Road near the Red Hill Fire Tower). Weekend Weather Forecast: Friday will be partly cloudy with a small chance of snow showers. The temperature will get to a high of about 34° and a low overnight of 25°. Saturday will start out as partly sunny with a high of 34°. By 3 p.m. possible rain and sleet are in the forecast, becoming rain by late afternoon. The overnight low for Saturday is 30° and there is a 90% chance of freezing rain after 1 a.m. Sunday rain is likely before 1 p.m. Temperatures will reach a high of 46°. Mild winds and 70% chance of precipitation. The low on Sunday night is about 37° with a small chance of rain. Hunting Season: Regular deer and bear hunting seasons are here and continue now through mid-December. The DEC’s website has some useful maps of New York to stay current with region and species-specific hunting information. Hunters can sign up for licenses with the DEC’s resource list of local outfitters. Hikers should dress in bright colors or florescent vests to stay obvious and visible. Know Before You Go – Planning and preparing are the keys to enjoying the outdoors. Sunsets are about 4:29 pm this weekend. In case of unexpected night hiking, keep a headlamp with you. If you’re planning to backpack, the DEC has a cheat sheet of New York State camping regulations. Help Keep Wildlife Wild – Fall is a sensitive time of year for all wildlife foraging here in the Catskills. Keep a safe distance from wildlife and store food properly both at home and in the backcountry. Animals across the park are preparing for winter and may be more active than usual. Keep a particularly close eye on your food and food scraps. Water Sources: Reliable water sources shown on trail maps are present but icy this weekend. If necessary boil snow for water. You should always plan to treat, filter, or boil any surface water before drinking. Local Resources for Winter Hiking Tips: Information is power! The Catskills 3500’ Club is hosting a Winter Prepardedness Class on December 1st. The Pine Hill Community Center will be hosting a meeting of the New York Citizen Preparedness Corps on December 6th (email mlemire@pinehillcommunitycenter.org for more information).